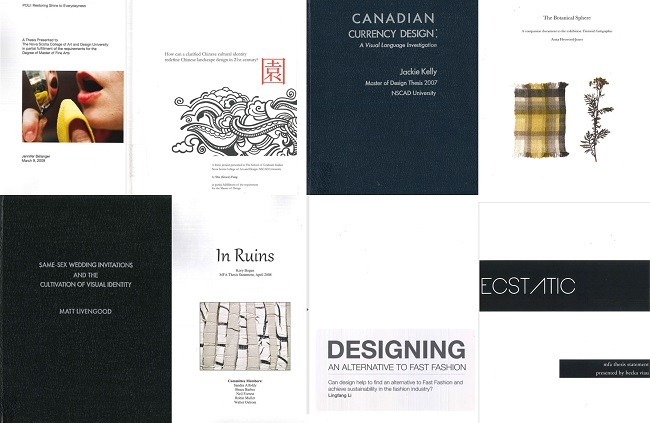 The Digital Theses Collection is a collection of over 300 individual graduate papers and documents from NSCAD University's graduate students from 1975 to now. These theses and artist statements have been a requirement of the Master of Fine Arts, Master of Design, and the Master of Art Education programmes. In the summer of 2016, all available these were digitized and described. Library of Congress subject headings and geospatial information were applied to each thesis (when applicable). These theses are searchable through their topics, location, degree, creator/author, and thesis advisors. This digitization project and subsequent upload to the repository was made possible through a Young Canada Works Internship grant awarded to the NSCAD Library. Please note: The theses and artist statements are becoming publicly available as permission approval is received by the authors and creators to make their work available on the repository.